On the picture, just above, you can see the main screen of the software with the main options to control it. You should get this screen if you start the software, if it si not the case there is already a problem. "Remove files": this is an action that allows to remove one or several files. These files have to be selected in the list of files. Use this action if you don't want convert a file, for example if you made a mistake or if you have changed your mind. "Convert" starts the conversion from one format to an other, you must have files in your file list in order it works. "Clear all" is an option that removes all your files in your file list. "Install software" is an action that allows to add a shortcut on your desktop to the current location of the software (usefull if you decide to change the directory of the software). To remove this shortcut, just erase it like any other file. To make it easier to understand, this menu is enough to make the software work if you have selected your format settings correctly and added some files in the file list. This list of files has a drag and drop support from windows's file explorer. The main function of this file list is to list the files to convert. There is a protection against duplicate files (same full path, but not same name!, so be warned that if you have a name twice that the first one will be overwritten). What can you do and what can't you do with the informations? The first column at the left of the list gives the name of the original file without the extension. Note that it is this name that is used to give the name of the output file (with the final extension at the end). If you single click twice (not a double click, a click, a pause and a click). 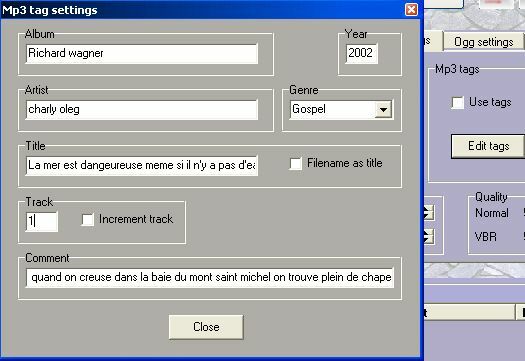 It gives an option to edit the name of the ouput file and some other options. The column "status", is useless while you have not started a conversion. But during the conversion, it gives the conversion progress in percent. If a conversion is done, it is written that it is. The last column gives the path (that should not be very usefull since the paths should look nearly the same). "Convert" starts the conversion and "abort" stop it. Note: Files are converted from the top to the bottom, and "abort" don't erase the file that has been aborted during it's conversion (same thing for the previously converted files). -you can select the ouput directory (if you don't choose one, all files will be written to the root of your hard drive: c:\ usually, but when the software starts it should select the current directory of the software as path). - the other pannels give the settings for each formats. Add your files, choose an output directory and press on the convert "button", that's all. For the other menus, they are differents for each formats. I don't want to explain each parameters of each file format. Perhap's will il create some pages in the question and answer part of my site to explain more on this topic and on the different options of wav, ogg and mp3 files. It is possible to access this menu if you click on "edit tag", in the "Mp3" tab. It is needed to click on "use tags" in order the use of the related datas is effective. On this sub menu, you can set the Id3v1 tags of the mp3 files. For Id3v2 tags you need to find an editor. For what is this editor useful for? Off course you could use it to convert one file just after an other and set each time the tags, if you want. This is just no very efficient, and it is probably better to use an other tag editor. Well, when you are converting files, the soft will assign tags to the file at the moment of it's creation. This setting can be useful if for example you're converting starting from the same album of the same artist (so same album, artist, year, style tag). After that, you can of course set specific comments for each files, you should save time anyway. Then you can (always to save time), set as title tag, the name of the file like it is in the title row in the file listing. (be careful this tag is limited in size). You can increment the track number starting from the first number that is written, useful for tracks of a same album, you can check the box "increment track" to use this option. Be sure that your files have a correct order in the file list.